Standard Engine: Kohler CH 620. Other Engines Available. Save about an hour on a job requiring 40 bags of mulch with a TurfMaker®. You can load 8 bags of Flexterra® in a TurfMaker® 1000 and go to work. Use 6 bags in a Finn T90. With 6 bags of mulch instead of 8 per tank load, it takes 4 tank loads instead of 3 to apply the same amount of mulch. 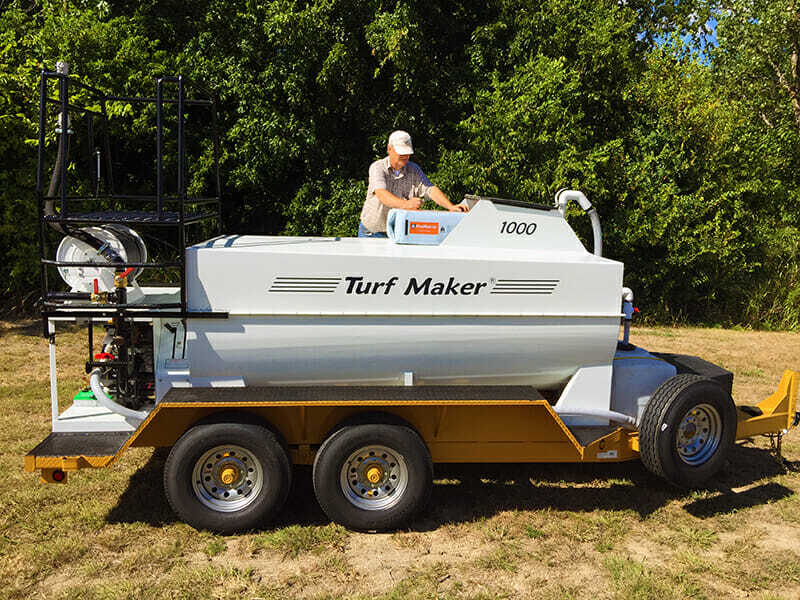 Add to that fact that the TurfMaker® can most certainly be loaded and ready to shoot in 2 or 3 minutes less time each tank load. Easily results in an hour time savings on the job site requiring 40 bags of mulch. Ask a TurfMaker® 1000 owner how much Flexterra HP-FGM® he loads per tank load. You will most likely get the answer, “8 bags”. Make the call yourself. And then ask how long it takes to load and mix the tank. Ask a Finn T90 owner how much Flexterra HP-FGM® he loads per tank load. You may get the answer, “6 bags per tank load”. Make the call. Get the answer for yourself. Also ask how long it takes to load and mix the tank. The answers to these questions are very important. Time is money – Make the calls! Then step up to TurfMaker®. Why Such a Big Difference in Productivity? The precision 2” and 3” steel gear pumps manufactured by TurfMaker® handle thick slurries much better than traditional centrifugal pumps. Entrapped air or pump cavitations just don’t occur with a TurfMaker® pump. The pump just chugs along at a very slow RPM and delivers thick mulch slurries with extreme power and without clogging. With hydraulics, this pump can run in reverse. It is so easy to remove any kind of stoppage by simply hitting reverse for a moment. Most Finn machines have a centrifugal pump engaged with an electric clutch (not hydraulics). This pump will not run backwards to clear a clog. Finn operators may need to partially disassemble a Finn machine at a job site to undo a clog. A Clog is a miserable time killer! TurfMaker® machines are known for pumping thick mulch slurries through long hoses. Pumping an 8 bag mix of Flexterra HP-FGM® 500 feet up the side of a mountain with a TurfMaker® 1000 is powerful pumping. Both the Finn and the TurfMaker® have reversible agitation. Reversible agitation is useful if a large piece of mulch jams the agitator. This most often occurs with a weak hydraulic system. A second issue is that if too much water is put into the tank before all the mulch is loaded, mulch will float on top of the water. Reversing the agitator can pull the floating mulch into the solution and get it mixed. TurfMakers® do not have cross members or other mulch catching points inside the tank. Look inside the tank of any other machine. Then consider the time and nuisance of cleaning that tank at the end of every work day.